The need for LRT in Edmonton was identified first in 1962 and has come a long way since the original Capital Line that runs from Clareview to Health Sciences. 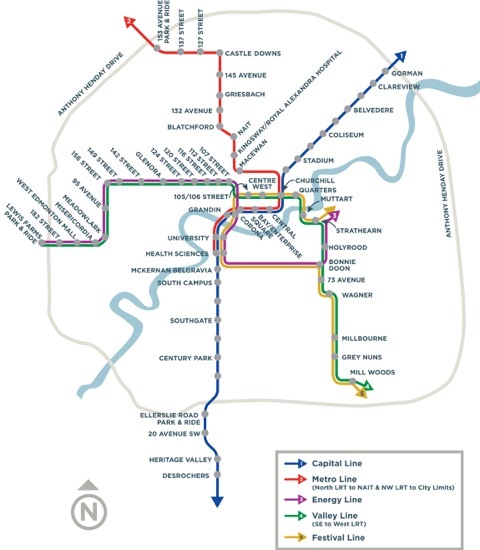 In 2009, around the time the Capital Line expanded from Health Sciences to Century Park, the City adopted a Long Term LRT Network Plan that defines the future size, scale and operation of Edmonton’s LRT system. The City considers the impact on property owners when approving projects and selects plans that minimize the need for the acquisition of private property. In some cases, privately-held property will need to be acquired in order for the project to move forward. The City prefers to acquire properties needed for a project that are listed or otherwise offered for sale. For properties not offered for sale, a City of Edmonton property agent will contact owners when the City begins to actively acquire properties for the project. City property agents will negotiate in good faith in an effort to reach agreement with the owners to buy the required properties for fair compensation. Expropriation is a process by which an authority such as a municipality can acquire property or a portion of a property without the consent of the owner. The process is governed by the Alberta Expropriation Act. Expropriation in Alberta is overseen by the Land Compensation Board. The City is committed to work with affected property owners to try to reach an agreement throughout the expropriation process. Expanding the LRT network is one way the City plans to meet the objectives of the Transportation Master Plan and Municipal Development Plan. The LRT Network Plan balances Edmonton’s long-term transportation needs with a commitment to grow green and create a compact, integrated urban environment featuring a high- quality, accessible transportation mode. The report outlines key characteristics of the future LRT network, recommendations on system style, vehicle technology, number of LRT lines in an ultimate LRT network, logical extent of those lines, circulation in the central area and tunnel capacity constraints. Strategies examine how potential LRT expansion fits in with long term plans to use land and manage growth. Two strategic studies for LRT are The Transportation Master Plan and LRT Network Plan. LRT Design Guidelines provide standards, guidance and performance-based design criteria for engineering and building LRT in Edmonton. These guidelines ensure that the City designs and builds a uniform system that is easy to maintain and upgrade. City projects adhere to City Design and Construction Standards. The City's High-Floor LRT Design Guidelines were updated in 2017. Council has provided direction to adhere to urban LRT principles in future high-floor LRT projects. In conjunction with the technical design guidelines, the City developed the LRT Design Guide, which introduced the urban style LRT design philosophy which the City coined “Sustainable Urban Integration” (SUI). With direction from the City and two years of public consultation, an extensive list of design guidelines for Sustainable Urban Integration (SUI) was established. These guidelines were incorporated into the LRT Design Guide, a document that became the foundation for specific design requirements included in the Valley Line LRT - Stage 1 Project Agreement. As a result of traffic-related concerns, Council approved a framework to evaluate if LRT crossings should be street level, above or below the road. Transit Oriented Development (TOD) is an approach to building a city that concentrates on housing, shopping and employment along a network of walkable and bikeable streets within a five minute walk of transit stations – or 400 metres in any direction.